Sediment filtration uses a filter media to trap particulates out of the water. The filter media comes in the different styles of depth, screen and surface filters, all with the function of removing sediment from the water. Using the right combination can be highly effective and be the most cost effective way to eliminate sediment from your water. Filter media usually doesn't trap the dissolved inorganics and other contaminants that effect your water's taste and smell. Using activated carbon filtration to absorb these contaminants from the water is the best way to eliminate odor and taste issues. The carbon adsorption process is controlled by the diameter of the pores in the carbon filter and by the diffusion rate of organic molecules through the pores. The rate of adsorption is a function of the molecular weight and the molecular size of the organics. Carbon is usually used in combination with other treatment processes. The placement of carbon in relation to other components is an important consideration in the design of a water purification system. 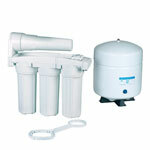 Reverse osmosis (RO) is the most economical method of removing 90% to 99% of all contaminants. The pore structure of RO membranes is much tighter than UF membranes. RO membranes are capable of rejecting practically all particles, bacteria and organics. In fact, reverse osmosis technology is used by most leading water bottling plants. Reverse osmosis is highly effective in removing several impurities from water such as total dissolved solids (TDS), turbidity, asbestos, lead and other toxic heavy metals, radium, and many dissolved organics. The process will also remove chlorinated pesticides and most heavier-weight VOCs. Reverse osmosis and activated carbon filtration are complementary processes. Combining them results in the most effective treatment against the broadest range of water impurities and contaminants.